This summer has thrown me. This is not how summer in Perth looks. Summer in Perth is hot and dry for days on end, with grateful sighs when the sea breeze comes in. Summer in Perth is not, I repeat not, hot and humid with thunderstorms, followed by a rainy drizzly day that could be found in any European summer. And yet this summer it is. This summer I have to adjust my vision of what summer looks like. This summer I have to accept that there is a possibility that summer in Perth is now defined by hot humid days. Maybe this is what my future summers will look like. Bubba Girl seems to have got it. She is not yet 2 and so I still have some say in her clothes for each day. 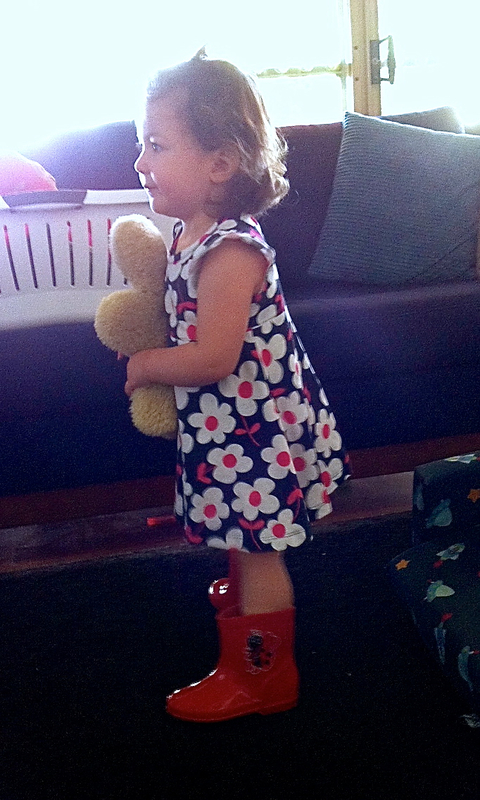 In this weather I inevitably choose a simple sundress but she has own particular ideas about footwear and her current favourite is gumboots. It is an absolutely adorable combination so it is an easy win. In some ways I find it easy to accept the shifts and changes of the seasons. The mild spring to hot summer, the blustery autumn to rainy winter. I am even learning to take in my stride the alterations to my perceptions of the seasons and how they change as the years go on. Yet I find it more difficult to adjust my perceptions of my life in the same way. I am no longer in my 20’s, heck I am pretty near no longer in my 30’s. I have different priorities, different strains and stresses in life than previously. I have changed and evolved, become wiser on some things, and just more entrenched on others. I have things I need to accept and things I need to cast off. Maybe I need to start by adjusting my impressions of what summer in Perth looks like, maybe I need to invest in gumboots and a sundress to start, and move on from there? !